Home » Gallic Headdresses. Merovingian. GAUL Plate 7. Gallic Headdresses. 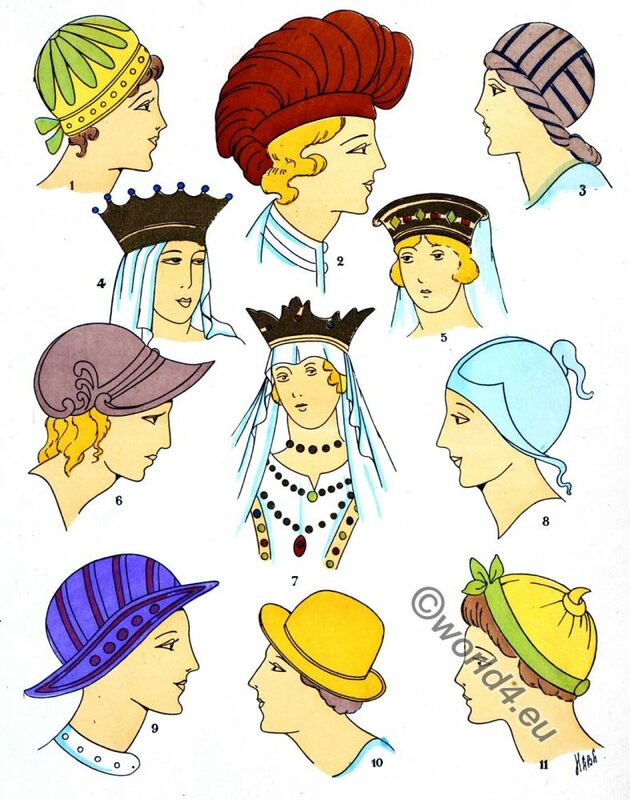 Gallic Headdresses. Merovingian fashion era. Part XII. – GAUL Plate 7. 1. Headdress in the time of Childebert or Coubert (570). Yellow cap trimmed with large green flowers. 2. Headdress under Childebert I. (5II-558). Brick red, full beret. 3. Headdress of a woman of Tournai (Strabon). 4. Headdress of Bertnide or Bertha (Time of Dagobert I). Crown surmounted with precious stones and trimmed with a white veil, framing the head and shoulders. 5. Headdress of a young woman of Lothani. Crown trimmed with precious stones and a white veil. 6. Pilgrim from Tournai (before the time of Strabon). Helmet shaped headdress, brown color. 7. Clotilde, wife of Clovis (end of 5th century). Headband encrusted with stone necklace round the neck and on the chest. This headdress is accompanied by a large white veil. 8. Sky blue Gallic headdress. 9. Headdress under Childebert I. This hat original in its form is none the less amusing with its mauve color and its red stripes and beading. 10. Gallic headdress. Color yellow ochre. 11. Small yellow cap, in the middle of which is a kind of flower or perhaps only a knot. A green band gives a cheerful tone. This entry was posted in 4th Century, 5th Century, Ancient, Celts, France, French fashion history, Gauls, Hat and tagged Celtic, Historical Gaul costumes, Merovingian fashion and history, Paul Louis de Giafferri on 4/2/18 by world4.